With the holiday season comes more activity both in your home and outside of it. This excess in people, visitors, and owner absences can put stress on a dog or cat. The best way to combat this is to minimize time alone for your pet, this can mean taking turns for shopping trips or even getting a friend or family member to look in on and stay with your pet. When having new people visit your home, make sure your pet gets to know them on their own terms. Don’t force an interaction, your dog or cat will let strangers know when they’re ready to mingle. If your pet simply can’t handle all the added noise, make sure to set up a room with his or her toys and a comfy sleeping area. Another big part of the holidays are trees and decorations. If you’re putting up a Christmas tree, make sure it’s always steady and not prone to tipping. Dogs and cats alike are very curious when it comes to new things in their environment and often test the boundaries. Having your tree secured with keep your pet safe. Skip the tinsel. Cats especially have a fascination with string and having it on the tree could be potentially hazardous to them. Be mindful of your decorations, make sure all your festive items are pet safe and out of reach. Never leave Christmas lights on or candles lit while you leave the house. Always keep people food away from your pets. Even though it may be tempting, especially during the holidays, to let your pets partake in a festive meal it may be at their own detriment. Many foods simply aren’t safe for your pets. Encourage your guest to keep their plates out of reach and resist feeding your cat or dog as well. 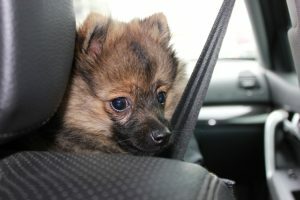 If you’re traveling for the holidays, make sure you always secure your pet and have plenty of food and water on hand. Whether traveling or staying home for the holidays, make sure you keep your pet safe. My Pet Pail keeps all of your pets must haves in one place with built in storage, an extra collar and leash, doggie bags, two built in pet bowls, two removable bowls, and two-20 oz. removal spill proof containers. My Pet Pail even comes with a utensil for your canned or raw foods. My Pet Pail is strong as well as stylish and the pedestal design is perfect for in-home use. My Pet Pail is a great travel dish for those on the go or home pet feeder for those chilling at home this holiday season!